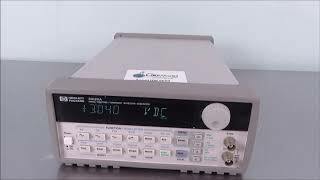 The Hewlett Packard 33120a Function Arbitrary waveform generator offers you precise, adjustable 15 mHz bandwidth that can be customized to meet your lab needs. This waveform generator uses direct digital synthesis technology to provide precise adjustment and frequency stability for clean low distortion sine waves. The 33120A also allows you to enter voltage values directly in Vp-p, Vrms or dBm. Internal AM, FM, FSK and burst modulation, as well as setting the sweep rates from 1ms to 500 s. Outputs for the HP 33102A can be generated in sine, square, ramp, triangle, noise & DC waveforms with 12-bit resolution. The HP 33102A has a sample rate of 40 MSa/s and can hold up to four 16,000-deep wave forms in non-volatile memory. This arbitrary waveform generator features an easy to use upfront keypad and turn knob control panel that allows you to program and customize complex wave forms, like a heartbeat. This HP 33120a 15 MHz Function/ Arbitrary Waveform Generator has been fully inspected and is operating without issue. All of our lab equipment comes backed with our standard warranty. Should you have any questions, please don't hesitate to contact us.